As the year comes to a close, it is time to review how the macro consensus forecasts for 2016 that were made a year ago fared. Each December, I compile consensus economic and financial market forecasts for the year ahead. When the year comes to a close, I take a look back at the prognostications and compare them with what we know actually occurred. I do this because markets generally do a good job of pricing in consensus views, but then move -- sometimes dramatically -- when the consensus is surprised and a different outcome transpires. When we look back, with 20/20 hindsight, we can see what the surprises were and interpret the market movements the surprises generated. Of course, the biggest forecast misses of 2016 were not in the economic indicators and financial markets, but in the political arena. The consensus views of political pollsters were that Brits would vote to remain in the European Union and that Hilary Clinton would win the US Presidential election. Instead, the actual outcomes were Brexit and President-elect Donald Trump. These political misses have had and will continue to have significant economic and financial market consequences. In the context of these political surprises, it's not only interesting to look back at the notable global macro misses and the biggest forecast errors of the past year, it also helps us to understand 2016 investment returns. Since the Great Financial Crisis, forecasters have tended to be over-optimistic in their real GDP forecasts. That was true again in 2016. Average real GDP growth for the twelve countries we monitor is now expected to be 3.0% compared with a consensus forecast of 3.5%. In the twelve economies, real GDP growth fell short of forecasters' expectations in eleven and exceeded expectations in just one. The weighted mean absolute forecast error for 2016 was 0.51 percentage points, down a bit from the 2015 error, but still sizeable relative to the actual growth rate. Based on current estimates, 2016 real GDP growth for the US fell short of the December 2015 consensus by 0.8 percentage points, a bigger downside miss than in 2015 (-0.5) or 2014 (-0.1). The biggest downside misses for 2016 were for Russia (-1.6 pct pts), Brazil (-1.4), India (-1.1) and Mexico (-0.8). China's real GDP beat forecasts by 0.1. Canadian forecasters missed by -0.5 pct pts, a little less than the average miss. On balance, it was a sixth consecutive year of global growth trailing expectations. Inflation forecasts for 2016 were also, once again, too high. Average inflation for the twelve countries is now expected to be 2.2% compared with a consensus forecast of 2.6%. Nine of the twelve economies are on track for lower inflation than forecast, while inflation was higher than expected in three countries. 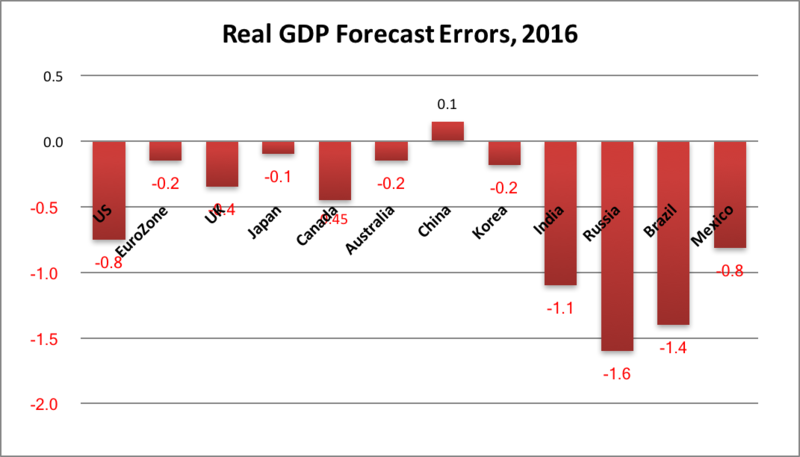 The weighted mean absolute forecast error for 2016 for the 12 countries was 0.33 percentage points, a much lower average miss than in the previous two years. 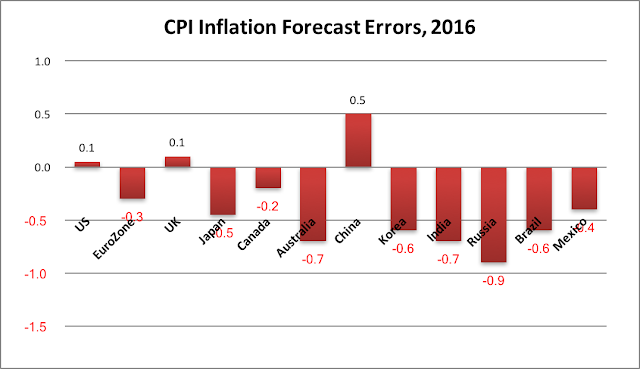 The biggest downside misses on inflation were in Russia (-0.9 pct pts), India (-0.7), Australia (-0.7), and Korea (-0.6). The biggest upside miss on inflation was in China (+0.5). UK and US inflation were also slightly higher than forecast. 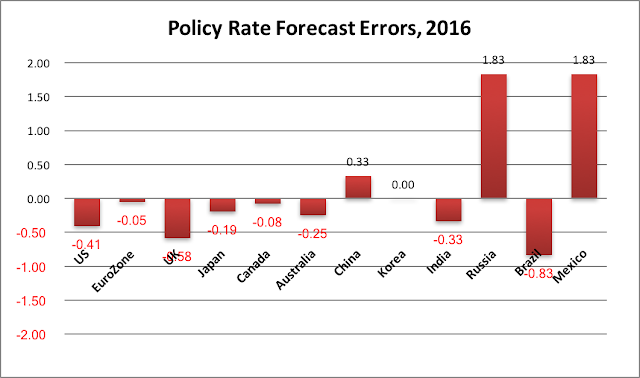 Economists' forecasts of central bank policy rates for the end of 2016 once again anticipated too much tightening by developed market (DM) central banks, but for emerging market (EM) central banks, it was a more mixed picture. In the DM, the Fed failed to tighten as much as forecasters expected. The biggest DM policy rate miss was in the UK, where the Bank of England had been expected to tighten, but instead cut the policy rate after the Brexit vote. The ECB, the Bank of Japan, the Reserve Bank of Australia and the Bank of Canada also unexpectedly cut their policy rates. In the EM, the picture was more mixed. In China, where inflation was higher than expected, the PBoC did not deliver expected easing. In Brazil and India, where inflation fell more than expected, the central banks eased more than expected. In Russia where inflation also fell, Russia's central bank eased less than expected. In Mexico, where the central bank was expected to tighten, the tightening was much greater than expected after the Trump election victory caused the Mexican Peso to fall sharply. 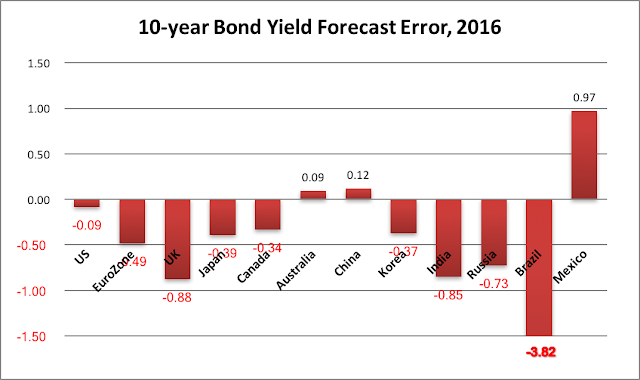 In nine of the twelve economies, 10-year bond yield forecasts made one year ago were too high. Weaker than expected growth and inflation combined with major central banks’ decisions to delay tightening or to ease further pulled 10-year yields down in most countries compared with forecasts of rising yields made a year ago. In five of the six DM economies that we track, 10-year bond yields surprised strategists to the downside. The weighted average DM forecast error was -0.33 percentage points. The biggest misses were in the UK (-0.88 pct. pt. ), Eurozone (proxied by Germany, -0.49), Japan (-0.39), and Canada (-0.34). In the EM, bond yields were lower than forecast where inflation fell more than expected, in India and Russia. The biggest miss in the bond market was in Brazil, where inflation fell much more than expected and reduced political uncertainty saw the 10-year bond yield almost 4 percentage points lower than forecast. Bond yields were higher than expected in China, where inflation was higher than expected, and much higher than expected in Mexico where political risk increased with Trump's election. Currency moves against the US dollar were quite mixed in 2016. The weighted mean absolute forecast error for the 11 currencies versus the USD was 5.4% versus the forecast made a year ago, a smaller error than in the previous two years. The USD was expected to strengthen because many forecasters believed the Fed would tighten two or three times in 2016. Once again the Fed found various reasons to delay, with only one tightening occurring on December 14. If everything else had been as expected, the Fed's delay would have tended to weaken the USD. But everything else was not as expected. Most other DM central banks eased policy by more than expected and the ECB and the BoJ implemented negative policy rates. In addition, oil and other commodity prices rallied causing commodity currencies like RUB, AUD, and CAD to strengthen more than forecast. 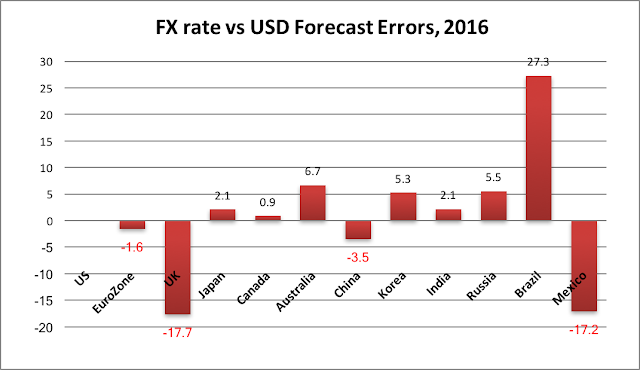 The biggest FX forecast misses were casualties of the big political consensus misses on Brexit and the US presidential election. The GBP was almost 18 percent weaker than forecast a year ago, while the MXN was 17% weaker than forecast after President-elect Trump promised to “tear up” NAFTA. The biggest miss on the upside was for BRL (+27%) where President Dilma Rousseff’s impeachment received a standing ovation from the currency market. A year ago, equity strategists were optimistic that North American stock markets would turn in a decent, if unspectacular, performance in 2016. However, despite a year characterized by weaker-than-expected real GDP growth and inflation and by political surprises that were widely-perceived as negative, North American equity performance exceeded expectations by a substantial margin. 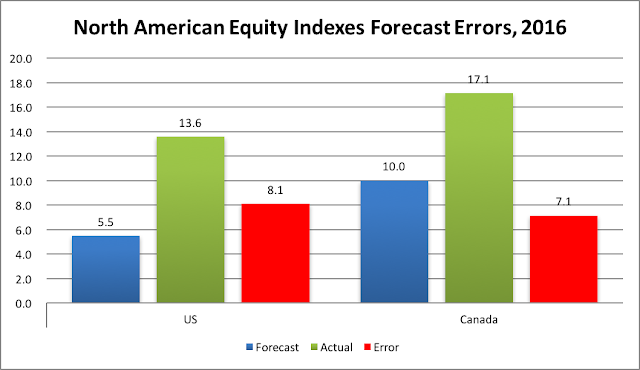 I could only compile consensus equity market forecasts for the US and Canada. News outlets gather such year-end forecasts from high profile US strategists and Canadian bank-owned dealers. As shown below, those forecasts called for 2016 gains of 5.5% for the S&P500 and 10.0% for the S&PTSX Composite. As of December 14, 2016, the S&P500, was up 13.6% year-to-date (not including dividends) for an error of +8.1 percentage points. The S&PTSX300, rebounding from a sizeable decline in 2015, was up 17.1% for an error of +7.1 percentage points. 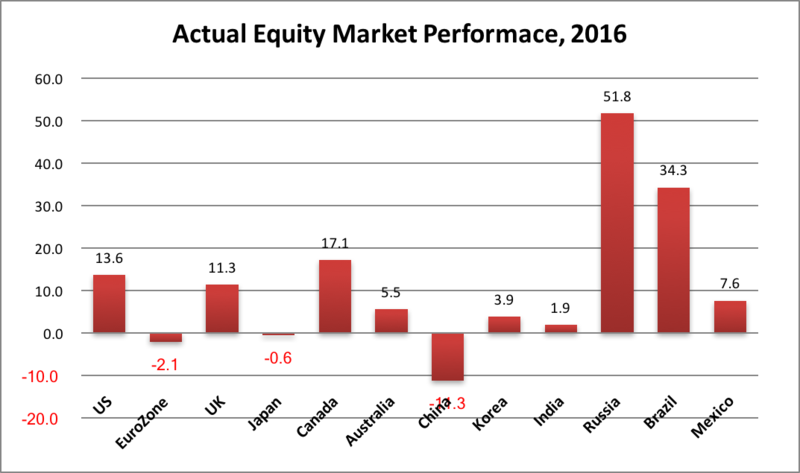 Globally, actual stock market performance was less impressive than that of North American markets, with two notable exceptions, Russia and Brazil. Stocks performed poorly the Eurozone and Japan, where deflation worries caused central banks to adopt negative interest rates. China saw the biggest equity loss (-11.3%) of the markets we monitor as slowing growth and fears of currency devaluation fueled large capital outflows. In the US, where the Fed delayed monetary policy tightening, and in the UK, where the BoE unexpectedly eased, equities posted solid gains. In Canada, and Australia, where central banks eased more than expected, equities were also boosted by a recovery in commodity prices. Russia and Brazil posted huge equity market gains, rebounding from large currency and equity market declines in 2015. While the 2016 global macro forecast misses were similar in direction, they were generally smaller in magnitude relative to those of 2015 and the investment implications were different. Global nominal GDP growth was once again weaker than expected, reflecting downside forecast errors on both real GDP growth and inflation. In 2016, most central banks either tightened less than expected or eased more than expected, but continued political uncertainty, weaker than expected nominal GDP growth and the strong US dollar held the US equity market in check through early November prior to the US election. Although many strategists argued that a Trump victory would be bad for US equities, because of uncertainty over his policies in general and his protectionist views in particular, the opposite reaction followed the election. US equities outperformed by a wide margin. US small caps and financials led the gains on Trump’s promise of reduced regulation, corporate tax reform and a steeper yield curve. UK equities rallied in the aftermath of Brexit, boosted by the increased competitiveness generated by the sharp depreciation of the GBP. In Japan and the Eurozone, where governments failed to enact structural reforms and where central banks experimented with negative policy interest rates, equities badly underperformed. In Canada, Australia, Brazil, Mexico and Russia, rebounding commodity prices supported equity markets. In China, one of the few countries where reported nominal GDP growth was stronger than expected (despite on-the-ground reports of economic slowdown), equity prices fell as capital fled the country. Similar to the previous two years, downside misses on growth and inflation and central bank ease in most countries provided solid, positive returns on DM government bonds in the first 10 months of 2016. However, after the Trump election victory, as markets priced in stronger US growth and inflation and bigger US budget deficits, government bonds across the globe gave back much of their gains and significantly underperformed equities in all regions. Smaller divergences in growth, inflation and central bank responses, along with firming crude oil and other commodity prices, led to smaller currency forecast errors. For Canadian investors, the stronger than expected 5% appreciation of CAD against the USD meant that returns on investments in both equities and government bonds denominated in US dollars were reduced if the USD currency exposure was left unhedged. The biggest losers for Canadian investors were Eurozone and Chinese equities, as well as most DM sovereign bonds, especially if unhedged. As 2017 economic and financial market forecasts are rolled out, it is worth reflecting that such forecasts form a very uncertain basis for year-ahead investment strategies. The high hopes (and fears) that markets are currently pricing in for a Trump presidency will surely be recalibrated against actual policy changes and foreign governments’ policy reactions. The lengthy period in recent years of outperformance by portfolios for Canadian investors that are globally diversified, risk-balanced and currency unhedged may have run its course. Global asset performance may be shifting toward a more US-centric growth profile that could also benefit Canada if Trump’s protectionist tendencies are implemented only against China, Mexico and any other countries a Trump-led America deems to unfair traders. While such an outcome is possible, 2017 will undoubtedly once again see some large consensus forecast misses, as new surprises arise. As an era of rising asset values supercharged by ever-easier unconventional monetary policies seems to be coming to an end, the scope for new surprises to cause dramatic market moves has perhaps never been higher.